In her 30-plus years living in Glens Falls, the late Joyce Stock served as a nurse at Glens Falls Hospital, built a popular restaurant and raised three sons who share her philanthropic generosity. 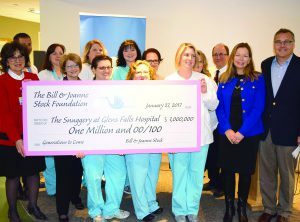 In January, her eldest son, Bill, returned to Glens Falls to honor his mother’s memory and with one of the largest philanthropic gifts in Glens Falls Hospital history in the form of a $1 million donation from the Bill and Joanne Stock Foundation. The money will go toward a $5 million renovation project underway at The Snuggery family-centered birthing unit at the hospital. The hospital announced that the birthing unit will now be known as The Joyce Stock Snuggery at Glens Falls Hospital.